Last night I dreamed I was in a pale white corridor. There was no one there except me and the lion. I heard voices in the distance but didn’t see who they belonged to. But I knew they were there, just ahead. The lion and I were hungry. I had somehow found a rabbit and killed it as I held onto its cold, white fur. My waking self doesn’t eat rabbits, or any mammals for that matter. But I’m thinking this was pure survival. I tossed the rabbit towards the lion. A grand, altruistic gesture. 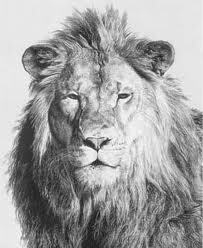 Just when I began to smile in self-gratification the lion leapt over the rabbit and lunged at me. His teeth dug instantly into my neck. I could feel his warm breath on my skin. His coat rubbed against me as if it were a soft, hairy blanket. I wanted to scream to the voices. But I knew there was no chance of me leaving the lion’s grip. There was nothing anyone could do even if they were to appear at that very moment. The moment that would be the end of my life. I thought about the rabbit. And I wondered why the lion chose me instead. But in a flash I knew. The rabbit would be there after I was gone. And my being gone meant no competition for the lion. No threat. In those final moments I was not angry at the lion. This was not personal. He was only following his instincts. That is the nature of the beast. This is me. Writing. Sometimes funny. Sometimes not. Sometimes poetry. Sometimes not. Rated PG 13 because my dad reads it.